Last Saturday, for the first time since 2010, Ohio lost to Marshall in the Battle for the Bell. 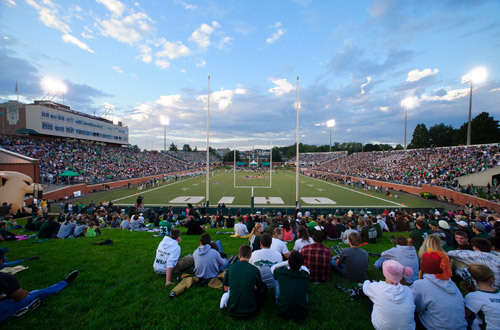 Ohio returns to Peden Stadium for its 2014 home opener on Saturday. Photo by ohiobobcats.com. The Bobcats trailed 41-0 before saving what was left of their dignity and leaving Huntington with a 44-14 defeat. Marshall totaled 705 yards on offense, 257 of them from the running game. Ohio missed a field goal on its first possession, then failed to cross midfield until its first scoring drive late in the third quarter. Ohio (1-2, 1-0) will hope that a better result is in store for its home debut against the Idaho Vandals. Idaho (0-2, 0-1) won one game in each of its last two seasons, but the Vandals are not to be overlooked. 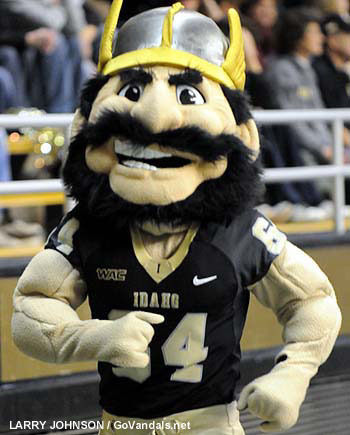 Idaho is a member of the Sun Belt in 2014. It was an FBS-Independent last season and a member of the now disbanded WAC prior to that. Paul Petrino, brother of Louisville coach Bobby Petrino, is in his second season as coach for Idaho. His freshman quarterback, Matt Linehan, has thrown for 686 yards and six touchdowns in his first two collegiate games. The Vandals do not struggle on offense, but it’s a different story on the other side of the ball. Last week against a mediocre Western Michigan offense, Idaho allowed 35 points in the first half and 243 rushing yards in the game. It allowed 534 total yards to UL-Monroe in its first game. The Ohio run game has struggled so far this season. The Bobcats have yet to score a touchdown on the ground, but the running back rotation of Ohio will hope to test the Vandal defense on the ground come Saturday. Photo by Larry Johnson, govandals.net. Offense: RB A.J. Ouellette – The freshman saw six touches last week at Marshall and came away averaging 7.8 yards per touch. He may see more action in his home debut. Solich has used Ouellette as a change of pace from Daz’ Patterson in the backfield and if Ohio gets a lead, he’ll get even more carries. Defense: DL Tarell Basham – The sophomore led Ohio with 7.5 sacks last season and was named to the FWAA Freshman All-America Team for his efforts. He’s tallied one sack so far this season, but he’ll have many opportunities to add to that total against a pass-heavy Vandal offense. Offense: WR/RB Richard Montgomery – Montgomery, a 5-foot-8 sophomore, is the quickest player on the Idaho roster and is the only big-play threat that the Vandals have. He’ll be seen in the backfield, lined up in the slot and back returning kicks on Saturday. Montgomery has proven to be explosive when he gets his hands on the ball, something Petrino says he intends on doing much more of. Defense: DL Maxx Forde – The senior defensive end has been a starter since his sophomore year and was named to the Sun-Belt Preseason First-Team. Forde had 5.5 sacks last season in addition to 63 total tackles, which was fourth-best on the team. Ohio has struggled with the defensive lines of Kentucky and Marshall in its past two games; Forde could pose another threat. Ohio 34, Idaho 24 – The Vandals aren’t going to roll over for Ohio, but the Bobcats should take this one. Ohio will execute better on offense and capitalize on its opportunities in front of the home crowd. Idaho is capable of big gains through the air, but the Bobcat defense learned its lesson against Marshall. Ohio holds off the late Vandal surge and sends the fans home happy.